If there was anything it was good at besides their tapsilog, it was marketing. Almost anyone who’s ever been to GoodAh!!! will remember it is “Open 25 hours,” and that they serve food that is “Good for every-all.” These lines, these double-take worthy lines. Their popularity dwindled down in the 90’s / 2000’s. I thought they shut down. Lately it seemed that someone had bought the GoodAh!!! brand and is now coming back very strong, getting more and more prominent as more franchisees resurrect it back to its glory days. I was happy to try it again when I ran some errands at the Market! Market! mall, where they have a branch at. 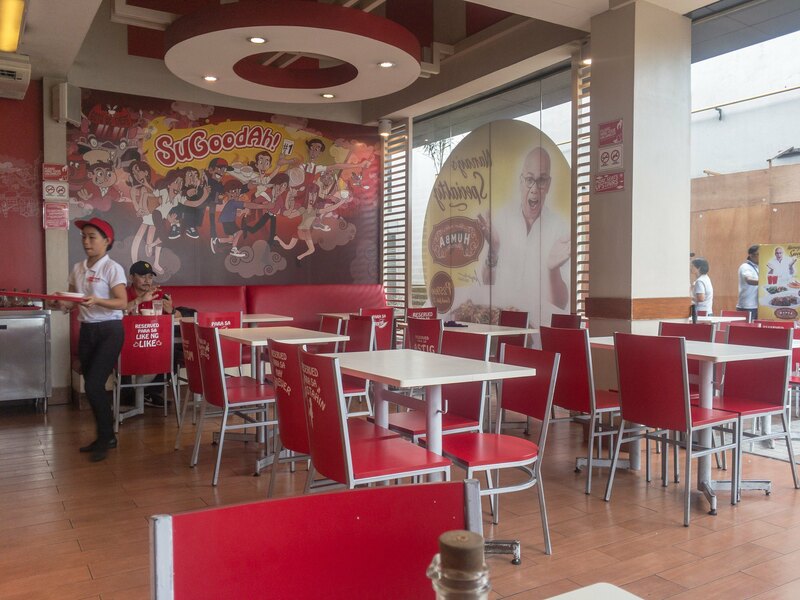 As a quick-serve restaurant (QSR), there is nothing too different about the set up. A few witty taglines here and there make you chuckle a little bit inside. The cashier, May, was truly pleasant to deal with. I should write the manager a commendation letter for May. 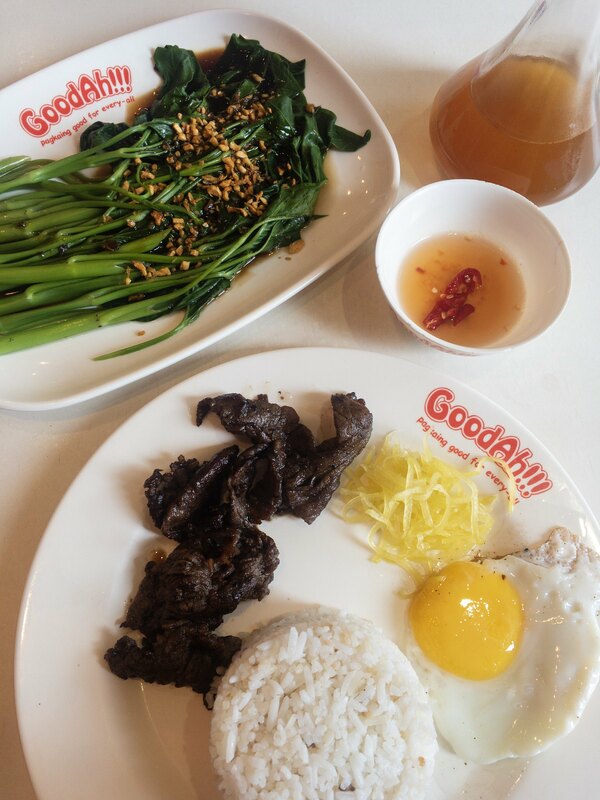 I was solo-dining so I ordered a tapsilog plus a side dish of garlic kangkong (water spinach). Like adobo, there is no perfect tapa. Each tapa/tapsilog is prepared differently. Some like it dry, some with a little bit of sauce, thin, shredded, what-not. The tapsilog came with reasonable thickness, yet I was surprised that it was tender. The server also came with a small container of prepared vinegar as dipping sauce. I reckoned, this was the kind of tapa that needs pairing with the vinegar. However, I found the fried rice to be nothing but just rice tossed in a little bit of oil. I wished there was any hint of garlic. 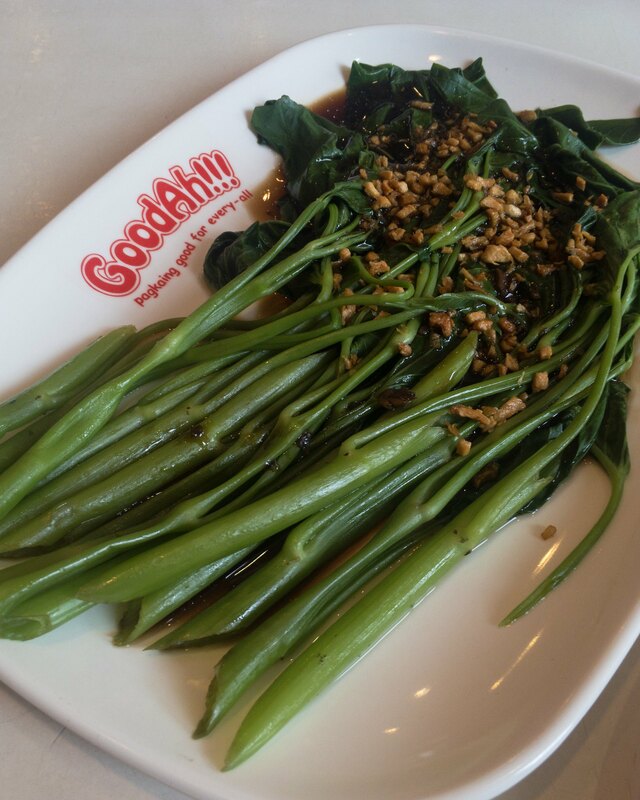 The garlic kangkong was well-prepared, and it wasn’t horribly dead and mushy. I like that it’s still bright green and crunchy when it was served. My meal was less than P200. (That’s less than US$4.) Was it worth it? Yes! I’d very much rather visit the store again than spend my money on some kiosk inside the mall. Also, my hubby was curious about how it tastes now, so we will come back. Have you been to Goodah!!! lately? I’m curious to try more items. Let me know what you liked! * I paid for my food and dined as a regular customer. You can read full disclaimer / disclosures here.